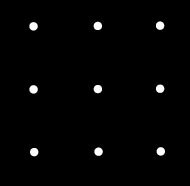 Can you connect these nine dots with just 4 straight lines? There are 4 men each wearing a either a black or a white hat. They are standing in rising water, cannot move and can only look forward. Between A and B is a brick wall which they cannot see through. They know that between them are 4 hats of which 2 are black and 2 are white, but they do not know which colour they are wearing. In order to stop the level of the water rising and drowning, one of them must call out correctly which colour hat he is wearing. They are not allowed to talk to each other and have 10 minutes to fathom it out. Which one of them calls out, and how does he work out which colour he is wearing? You have just walked into a dark two-storey house. There are three light switches on the first floor A, B and C. Only one of the switches works, and it turns on the light on the second floor. You cannot see the second floor light from the first floor and there are no windows in the building, but you do have a flashlight. You can only make one trip up the stairs, and you can only flip one switch at a time. How do you determine which of the three switches turns on the light on the second floor ? You are travelling down a road to a village. You reach a fork in the road and find a pair of identical twin brothers standing there. One of the brothers always tells the truth and the other always lies. If you are allowed to ask only one question to one of the brothers to find which is the correct road to the village, what is your question ? A bottle of wine cost £10. The wine was worth £9 more than the bottle. How much was the bottle worth? There is a house with four walls. Each wall faces south. There is a window in each wall. A bear walks by one of the windows. What colour is the bear? A boat has a ladder that has six rungs, each rung is one foot apart. The bottom rung is one foot from the water. The tide rises at 12 inches every 15 minutes. High tide peaks in one hour. How can you measure out 4 gallons of water into the 5 gallon bucket ? Think of words ending in 'gry'. There is a great underground empire where knights live. There are two kind of knights; Day-knights who tell the truth by day and lie at night. Night-knights, of course, do it the other way round. Since it is an underground empire, you can't tell the time of day by any natural means. But the knights always know whether it's day or night. So, as a visitor to this strange world, you once meet a knight who tells you "I'm a day-knight and it's night". Since you forgot to wind up your watch a few days ago, you don't know the time. But can you tell from this sentence, whether it's day or night? And can you tell, whether the knight is a Day-knight or a Night-knight? A princess is as old as the prince will be when the princess is twice the age that the prince was when the princess's age was half the sum of their present ages. If the princess is 40, how old is the prince? 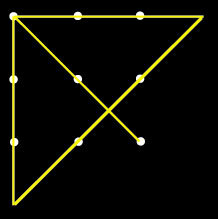 One hour after David started walking from X to Y, a distance of 45 miles, Lisa started walking along the same road from Y to X. If David’s walking rate was 3 miles per hour and Lisa’s was 4 miles per hour, how many miles had Lisa walked when they met? Have you worked out the answers ? C calls out that he is wearing a black hat. Why is he 100% certain of the color of his hat ? After a while, C comes to the realization that he must answer. This is because D can't answer, and neither can A or B. D can see C and B, but can't determine his own hat color. B can't see anyone and also can't determine his own hat color. A is in the same situation as B, where he can't see anyone and can't determine his own hat color. Since A, B, and D are silent, that leaves C. C knows he is wearing a black hat because if D saw that both B and C were wearing white hats, then he would have answered. But since D is silent, C knows that he must be wearing a black hat as he can see that B is wearing a white hat. Make sure that all light switches are in the "off" position. Flip the first switch A, and leave it on for about 10 minutes, or so. Then, turn switch A off. Flip the second switch B on, and go upstairs to the light bulb. If the bulb is off, but warm, it is the A switch. If the bulb is on, it is the B switch. If the bulb is off and cool, it is the C switch that you haven't turned on yet. You have successfully determined which switch controls the light bulb, and you have gone up the stairs only once. Point to one of the roads in the fork and ask the following question to one of the brothers. "If I ask your brother if this is the correct road to the village will he say yes or no?" If he answers is "no" then it is the correct way to the village. If the brother you are speaking to is the one who always lies, then he will say "no" as he knows that his brother who speaks the truth would anwser "yes". If the brother you are speaking to is the one who speaks the truth, he will say "no" as he knows that his brother will lie about it being the correct road. Either way an answer "no" tells you it is actually the right road. Similarly if you are pointing to the wrong road you will get the answer "yes". A common wrong answer is £1. Now, if the bottle were really worth a £1, then the wine, being worth £9 more than the bottle, would be worth £10. Hence the wine and bottle together would be worth £11. The correct answer is that the bottle is worth 50 pence and the wine is worth £9.50. Then the two add up to £10. You're left with four gallons of water in the 5-gallon bucket. These two lines are a "red herring" and have nothing to do with the question being asked. Notice this line does NOT say there are three words ending in "gry". The first word is the the second word is English , and the third word is language . Language is something that everyone uses every day. Try and work it out yourself. Don't guess - use the information given to produce a couple of algebraic equations which give you the solution.